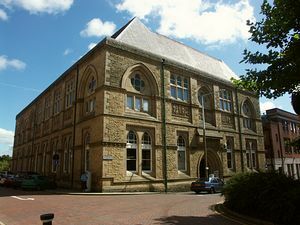 Blackburn Museum and Art Gallery is housed in a beautiful "Arts and Crafts" style building. Opened in 1872 originally as both a museum and a library, Blackburn Museum now offers a lively programme of exhibitions and events for all the family. Frederic Leighton's "Cherries" is probably the most popular painting in the Museum, but is only one of an exceptional collection of classical Victorian paintings. Hokusai's woodblock print, "The Waves at Kanagawa", is just one of a thousand Japanese prints in Blackburn's collection. In 1946 Edward Hart, the son of a local manufacturer, left the town his personal collection of 500 fine books and manuscripts and more than 6000 rare coins: a large selection of these artefacts is on permanent display in the Hart Gallery. Blackburn Museum houses one of the finest collections of Christian icons outside the British Museum. The bulk of the collection was gathered by Thomas Boys Lewis, a Blackburn cotton manufacturer, while other works have been bought with the help of the National Art Collections Fund and there are key works on loan from the Strang collection. The Museum has a fascinating collection of artefacts from around the world. Many were brought back to Blackburn by local missionaries who went to work in Africa, China and Oceania. The collection is very broad ranging and includes Maori artefacts, African masks and carvings, Chinese court costume, pre-Inca ceramics and native American artefacts. By far the largest collection in the Museum, the local history collection contains almost 40,000 items ranging from larger architectural pieces and mill machinery to children's toys, an extensive photographic archive and the contents of several local shops. Kathleen Ferrier was one of the most important operatic talents to emerge from Britain during the 20th century. She was an international celebrity whose recorded music still attracts an enthusiastic following almost 50 years after her tragically early death. Kathleen lived and worked in Blackburn and her sister, Winifred, has left the town a fascinating archive relating to her remarkable career. A selection of objects are generally on display and the archive can be viewed by appointment. The Museum has an award-winning South Asian Gallery representing the history, culture and heritage of Blackburn's South Asian population. Blackburn Museum has an enormous collection of material relating to the history of the cotton industry, including working models of spinning and weaving machinery in the Lewis Textile Museum. Town centre, near Town Hall.